High school senior Liv Evans has one rule: No attachments. She’s lost enough in her life and has vowed to do whatever it takes to make sure she never again feels the emptiness of losing someone she loves. Boys are a fun distraction, but a serious relationship is something she’d rather live without. Her determination for a future free of pain and heartbreak is put to the test when she meets–and quickly forms an unexpected bond–with Logan Tanner. Logan has always been a free spirit, but ever since a life-changing event took place, which left him doubting the integrity of those who are closest to him, he’s taken that term to a whole new dangerous level. Learning the hard way that life is too short for worries or work–and that women can’t be trusted–Logan has exchanged steady work for street racing. When Liv walks into his world, everything he thought he knew about life and women is challenged. In The Fine Line, Liv and Logan will discover if it’s possible for true love to have a future, or if history is destined to repeat itself. Alicia Kobishop, who was born, raised, and currently resides in the greater Milwaukee, WI area, is a happily married mother of 2 young children. 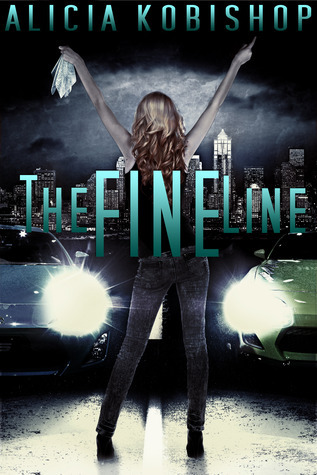 "The Fine Line," a new adult contemporary romance, is her debut novel. Seriously... I just read this entire novel in one sitting.... It's now 2am and I'm so happy that I started it tonight and read until I finished it! I'm also sad because I love Logan's character and didn't want it to end. Loved this book! Olivia is annoying throughout the novel because she has the broken view on relationships. She doesn't "do" relationships because she knows (per her mother's previous relationships) that they never work out. It's a tiny bit cliche but it works well in the plot. The chemistry between her and Logan is great but she's that annoying girl who tries to deny it so she can stay "just friends." I wanted to smack her over and over again. But Logan... Love him. He was so... magnetic. I wanted him on every page. I was cheering for him. Because Liv was so wishy washy here and there, the plot had a few moments where it was at a standstill. You're in Liv's head so much that you literally roll your eyes a few times... Her friends tell her to pay attention and SEE what's right in front of her... But does she listen? There's a few different climaxes in the novel where you're biting your nails... They're emotional pieces of the plot that leave you begging yourself to read faster. Loved it. Overall, loved this book & can't wait to read more from this author! I literally didn't put it down and read the entire novel straight through. Ending: 5 Stars <-- Loved it!